Are you looking for the perfect Western pistol or Western revolver for your collection? If so, you have come to the right place! We carry a fantastic array of Western replica pistols inspired by tales of the Wild West. These western replica fire arms are authentic reproductions of guns used during the 1800s. 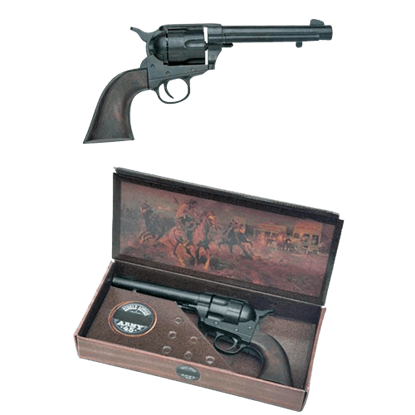 These Old West guns and cap guns have functional parts, but will not fire live ammunition, making them ideal for stage productions and historical reenactments. 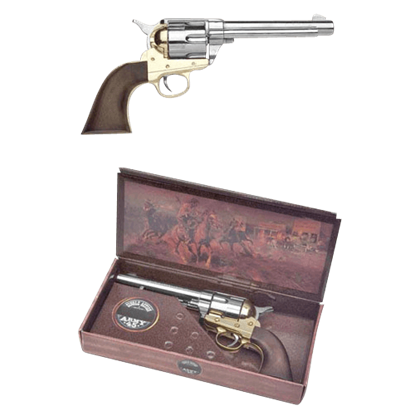 Our inventory includes excellent pieces like cavalry revolvers, Colt army revolvers, Peacemaker replicas, cowboy guns, derringers, Volcanic repeaters, and more. 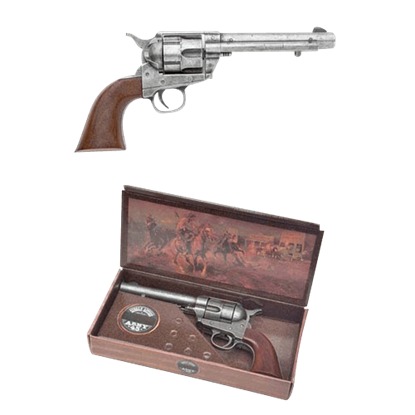 We also sell decorative gun plaques and boxed sets perfect for putting on display, which show off famous weapons used by figures like Wyatt Earp, Wild Bill, Pat Garrett, Jesse James, General Custer, Doc Holliday, and Billy the Kid. 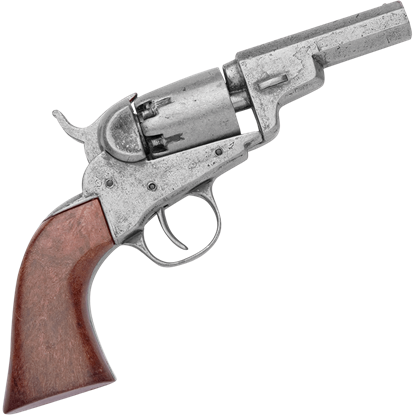 As its introduction coincided with the settlement of the Wild West, the names Peacemaker and Frontier Six-Shooter were popular with this pistol. Although most were produced for the military, some Colt SAAs were engraved at the factory. More Model 1849 Pocket Pistols were produced than any other cap-and-ball firearm. Over its 23-year production life (1850 - 1873) about 340,000 pieces were made in total. Some 200 variations were produced during this time. 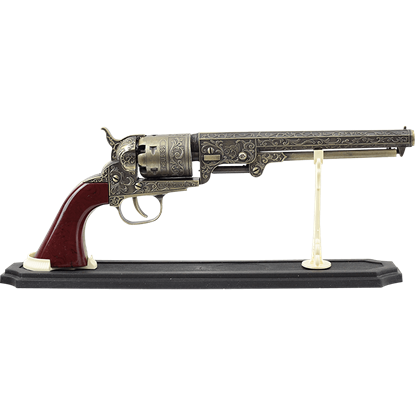 The 1862 Navy Pistol Pewter is made of antique finished zinc metal and polished European hardwoods. The screw heads are molded into the metal and cannot be removed. The 1862 Navy Pistol Pewter cannot be made to fire real ammunition. 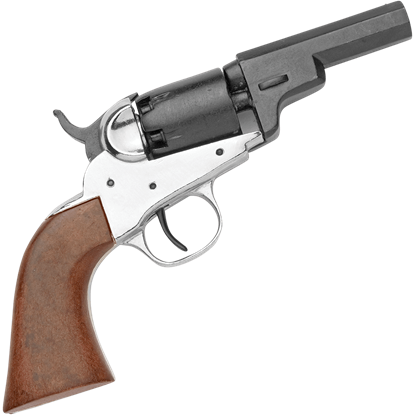 The Single Action Army is one of the best known western revolvers. This 1873 Antiqued Colt Army Revolver recreates one of the first generations of this gun, possessing details to make this replica look like a real western revolver. 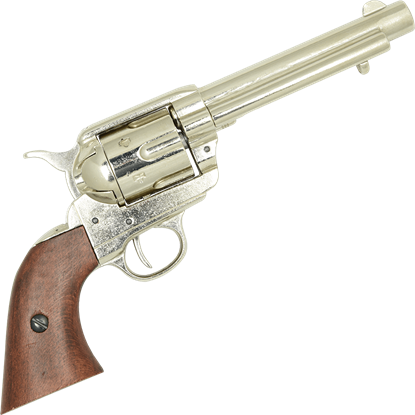 The Single Action Army is one of the best known western revolvers. This 1873 Black Colt Army Revolver recreates one of the first generations of this gun, possessing details to make this replica look like a real pistol. The Colt Single-Action Army Revolver was produced from 1872 to 1940. 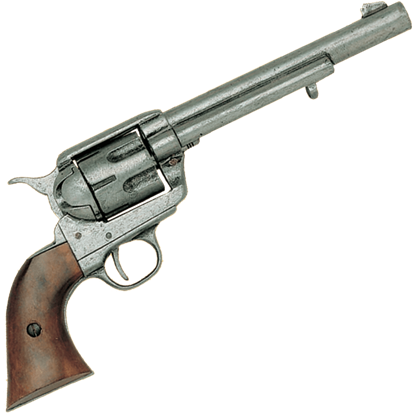 Used by legends like Buffalo Bill Cody, Wild Bill Hickock, and Pat Garrett, it was also the weapon of choice for settlers in the West during the late 19th century. The Colt Single-Action Army Revolver was produced from 1872 to 1940. Used by legends like Buffalo Bill Cody, Wild Bill Hickock, and Bat Masterson, it was also the weapon of choice for settlers in the West during the late 19th century. 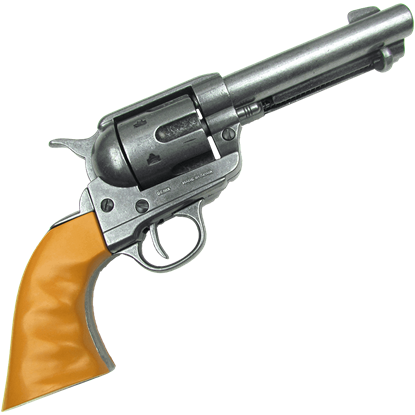 The Single Action Army is one of the best known revolvers. This 1873 Nickel Colt Army Revolver recreates one of the first generations of this gun, possessing details to make this replica look like a real western pistol. Made by Colt, the Single Action Army is one of the most iconic revolvers of the wild west. With its long barrel, the 1873 Nickel SAA Cavalry Pistol was designed for mounted use, although its reliability made it a favorite among gunmen. Based on the Colt Navy Revolver from 1851, the Antique Brass Revolver is a cap and ball revolver that has been heavily decorated, to the point that it appears more like some kind of military award than a pistol or replica firearm. It is the gun that won the west and was is both a piece of American Military history and American popular history. 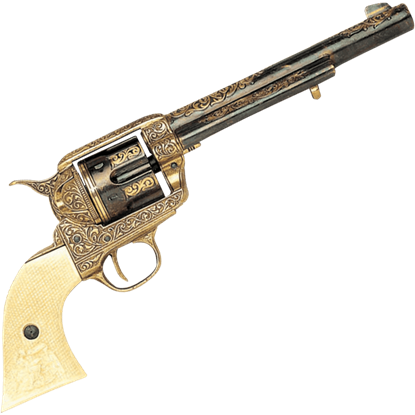 Though its majesty cannot be reproduced, it can be replicated with the Auburn M1873 Fast Draw Replica.